Reuters live coverage of events around the world. 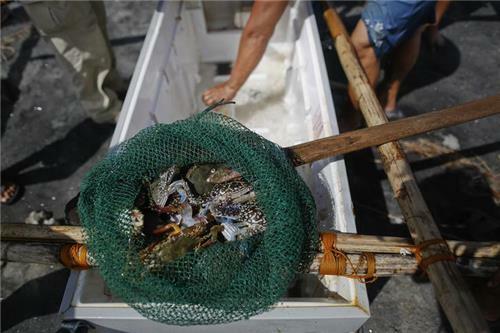 Follow @ReutersWorld on Twitter for top news and @ReutersLive for live video events. 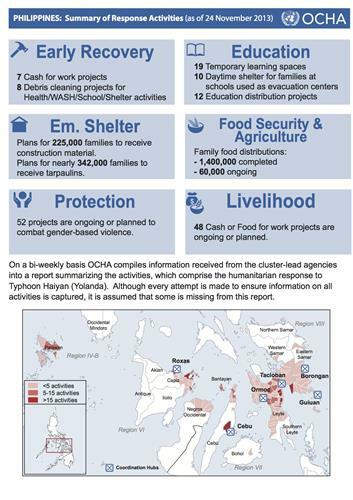 Summary of response acitivities, according to UN Office for Coordination of Humanitarian Affairs (UN OCHA), as of Nov 24. Click on infographic to see bigger version. NEW YORK (Thomson Reuters Foundation)—United States Agency for International Development (USAID) applied lessons learned from the tsumani in Indonesia and earthquakes in Haiti and Pakistan in its response to the super typhoon Haiyan in the Philippines, according to a top agency executive official just back from a weeklong visit to the devastated region. “One of the lessons we’ve applied is the local purchase of rice,” Nancy Lindborg, USAID's assistant administrator of the Bureau for Democracy, Conflict and Humanitarian Assistance, told Thomson Reuters Foundation. USAID fielded an experienced 19-person disaster assistance response team on the ground in the Philippines, supplemented by 50 to 60 additional personnel from USAID’s Philippines mission and its Washington headquarters, she said. USAID gave immediate cash--$7,750,000 according to UNICEF’s fact sheet-- to the World Food Programme so that it could purchase rice from local and regional sources, getting it to the people who needed it far faster than by bringing in food from outside, she said. The result was food parcels distributed to 2.7 million families. The rice was supplemented by nutritious biscuits and other items flown in from USAID’s regional distribution hub in Dubai, airlifted by U.S. military transport planes. The agency also employed U.S. military aircraft, such as Blackhawk helicopters and Osprey aircraft, to airlift supplies to remote areas in the days before roads were cleared. In addition, to date USAID has provided heavy duty plastic sheeting to 20,000 families for temporary shelter, hygiene kits to prevent disease to another 20,000 and water containers to 30,000 households, Lindborg said. USAID allocated $750,000 to UNICEF to restore the municipal water system in the devastated city of Tacloban. The repaired system currently is supplying clean water to 200,000 people in that area, she said. “The U.S. government put $49 million into the response and that is money that already has been turned into urgent, lifesaving assistance and put into the hands of the people that need it most,” Lindborg said. Any lessons learned from the response to the typhoon, Lindborg said, will come when the crisis is over and the after-action reports are analysed. The impact of Typhoon Haiyan is still taking its toll on the Philippines, with key infrastructure such as hospitals destroyed by the storm. The BBC's Rajesh Mirchandani visited a field hospital set up by German and Belgian medics in Palo, near Tacloban, the only medical centre available in the area. Residents in typhoon-hit Guiuan evacuated to this school, but the roof was ripped off by the storm, so they are only using the bottom floor, as seen in this video from Plan International. "With the relief now flowing, people are starting to get back on their feet... I saw people cooking and selling items in the street, fixing their homes, and clearing roads. At the same time there are still many areas such as Guiuan where almost no assistance has got through to people yet. We still have a huge amount to do and will be standing with and working alongside the Philippines people for as long as it takes." Please can we have our bells back? 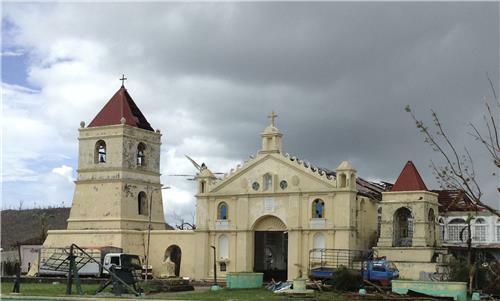 Typhoon-wrecked Philippine town asks U.S.
Reuters reports: In the devastated coastal Philippine town of Balangiga, animosity has festered for more than a century over the seizure of the town's church bells by U.S. troops during the 1899-1902 Philippine-American War. Marciano Deladia, a chief aide to the mayor, and other residents are thankful for the U.S. packets of rice and other food in the typhoon's aftermath. "But we want our bells back," he said. Two of the bells are at the Warren Air Force Base in Wyoming. The third is part of a travelling museum now at a base in South Korea. Two British politicians write in the International Business Times today about the needs of women and girls in disasters: Whenever conflict or natural disaster devastates communities, women and girls will face specific dangers because of their gender. In addition to losing their homes and loved ones women and girls also face the added risk of gender based violence, such as sexual assault, domestic violence, trafficking and early or forced marriage. A team from the International Rescue Committee is in the Western Visayas, one of the hardest-hit regions, yet is has only received limited emergency assistance. Plan International staff got video of the Typhoon Haiyan storm surge washing away a house. 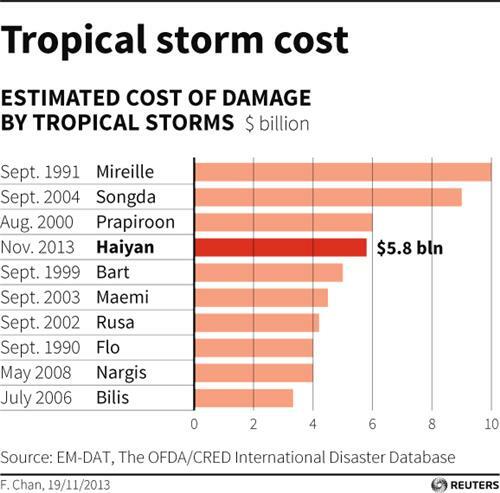 Typhoon Haiyan has damaged the 2013 main rice crop, harvesting of which was well advanced, and also disrupted planting of the current 2013-2014 secondary season. As a result, the U.N. Food and Agriculture Organization (FAO) has downgraded its forecast for the Philippines’ 2013 rice production to 18 million tonnes from the expectation of a bumper crop of 18.9 million tonnes at the beginning of the season, FAO’s Global Information and Early Warning System (GIEWS) said in a news release on Tuesday. The rice production shortfall of 900 000 tonnes will be felt disproportionally in the five most affected regions. While rice production at the national level is likely to remain close to last year’s level, the damage at the regional level is more severe, FAO said, warning that farmers in typhoon-hit areas could face severe food security and livelihood problems if they do not succeed in planting the next crop in the weeks ahead. “Planting of the secondary season, mostly irrigated rice, was well underway and it is expected that crops are severely compromised. If we want to avoid entire regions of the country having to rely on food aid, we need to act now to help vulnerable families to plant or replant by late December,” Dominique Burgeon, director of FAO's emergency and rehabilitation division, said in the news release. “Ten days after Typhoon Haiyan, aid is still quite concentrated on Tacloban city and little aid has reached devastated rural areas on Leyte and Samar islands,” writes François Dumont of Médecins Sans Frontières (MSF). According to a Monday morning update, MSF - which has staff in Tacloban, further south on the coastal and inlands areas of Leyte island, Samar island to the east and Panay island to the north - has found an increasing number of diarrhoea patients in Dulag, on the east coast of Leyte island south of Tacloban. Team assessments indicate widespread destruction in cities and on islands to the southwest and west of Tacloban. Across the region, MSF is setting up tent and inflatable hospitals, as well as mobile clinics. staff at a rural health unit for the past three days. At the severely damaged Guiuan public hospital, an MSF logistical team is preparing to set up a tent hospital to provide secondary healthcare. Maternal care, including care for complicated deliveries and c-sections, has been identified as a priority, as most of the secondary healthcare capacity has been destroyed. In the coming days, MSF will start rehabilitation work on the hospital building. In Tacloban a team of eight is being reinforced with 10 additional staff from Cebu – including medical doctors, nurses, logisticians and a psychologist – to prepare the parking lot next to Bethany Hospital for setting up an inflatable hospital, which should be up and running in the next few days with an emergency room, inpatient department, operating theatre, post-operative ward, obstetrics & gynaecology unit, maternity delivery room, psychosocial activities, blood bank, X-ray, and an isolation ward in case of tetanus cases. South of Tacloban, starting on Monday MSF teams will provide primary healthcare at a fixed health post in Palo, and through mobile clinics in Talawan and Talosa, as well as basic care in evacuation centres in Ormoc town and the surrounding district. MSF is deploying a combined mobile clinic and assessment team to the town of Santa Fe, near Tacloban, and will provide medical care in Cebu where people being evacuated from Tacloban are arriving. In Dulag town (population 48,000) on the east coast of Leyte island, the health facility has been partially destroyed and the medical staff report an increasing numbers of patients with diarrhoea. The team plans to set up a tented hospital with surgical capacity in Burauen. Forty-seven tons of cargo arrived in Cebu on Sunday and three trucks loaded with logistical and medical materials are on their way to Burauen by ferry, due to arrive on Monday. On Sunday, teams carried out further assessments by helicopter of several small islands northeast of Panay island. 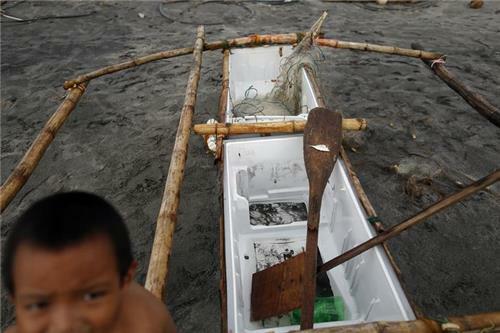 The northeastern coastline of Panay and the islands have been severely affected, and teams estimate 90 percent destruction. The immediate needs are for shelter and water, while access to healthcare is also a major concern. MSF expects to see many people with respiratory illnesses and diarrhoea. On Saturday, MSF teams also visited the towns of Balasan, Sara, Bagacai, Estancia and San Dionisio in Iloilo province, where many health facilities are destroyed. MSF plans to establish a base in Estancia and carry out mobile clinics from there. Teams will travel by boat to reach the small islands east of Panay. 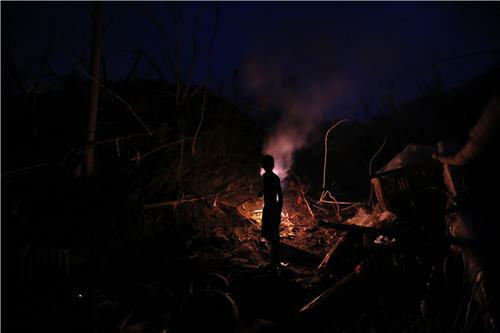 The risk of skin disease, diarrhoea and tetanus are high in storm-hit central Philippines where homes have been flattened and most of the health infrastructure damaged, medical charity Medecins Sans Frontieres (MSF) said on Sunday. "One of the emergencies in the short-term is to restore a minimum of access to healthcare for the population," said Jean Pletinckx, MSF emergency coordinator who is overseeing the organisation's response to Haiyan, known locally as Yolanda. Thomson Reuters Foundation correspondent Thin Lei Win talks to evacuated survivors who have made their way to Cebu. Ricael Ebar Alcover waited eight days before his knee - which had been pierced by a shard of glass when the typhoon hit - was treated. 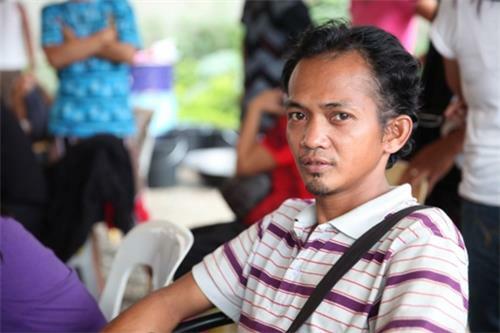 Like many other survivors, Alcover made it to an evacuation centre in Cebu, about 250 kms (155 miles) away from his home - hoping for a job and a place to stay. "If my injury is healed and Tacloban is safe again, we can go back," he said wistfully. He shrugged when asked when he expects that to happen. The humanitarian situation in the areas devastated by Typhoon Haiyan (Yolanda) is catastrophic. Over half a million men, women and children are homeless and living in the open, desperate for food, safe drinking water, basic shelter and sanitation. A disaster of this magnitude calls for a massive response. The Government of the Philippines mobilized relief operations under extremely challenging circumstances. The humanitarian community has declared the highest level of emergency response. The scale and scope of this tragedy has shocked everyone. The United Nations and humanitarian partners are mounting a major aid operation throughout the affected area. Britain has pledged a further £30 million to support the U.N. and Red Cross emergency appeals for the Philippines, Prime Minister David Cameron announced on Saturday. 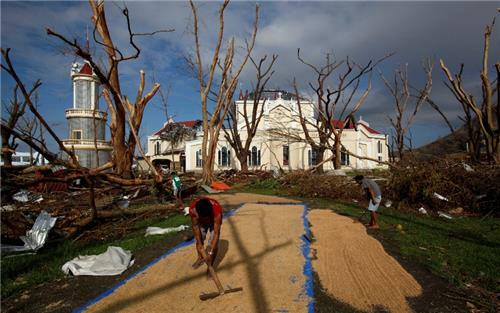 The funding will be used to deliver vital supplies to more than 500,000 victims of the Typhoon Haiyan and support UN and Red Cross teams working on the ground as they coordinate the international relief effort, the UK Department for International Development (DFID) said in a statement. He also announced that the UK will deploy a C130 plane to help with the relief efforts. The C130 will assist DFID, the U.N. and national authorities with the internal delivery of humanitarian aid and the movement of personnel. 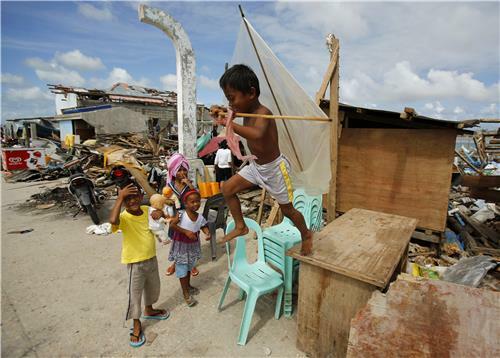 Survivors begin rebuilding homes destroyed by one of the world's most powerful typhoons and emergency supplies flowed into ravaged Philippine islands, as the United Nations more than doubled its estimate of people made homeless to nearly two million. But the aid effort was still patchy, and bodies still lay uncollected as rescuers tried to evacuate stricken communities on Saturday, more than a week after Typhoon Haiyan killed at least 3,633 with tree-snapping winds and tsunami-like waves. "We are very, very worried about millions of children," U.N. Children's Fund spokesman Marixie Mercado told reporters in Geneva. There are officially 1,179 people missing, according to the national count. Survivors and officials in Tacloban, which bore the brunt of the storm, have said the death toll could be many thousands just in the city as more bodies are discovered every hour. After long delays, hundreds of international aid workers set up makeshift hospitals and trucked in supplies on Saturday, while helicopters from a U.S. aircraft carrier ferried medicine and water to remote, battered areas where some families have gone without food and clean water for days. Aid flown in to Tacloban's congested airport finally trickled into ravaged neighborhoods. Work crews and heavy equipment cleared debris from roadsides, but side streets remained piled with the sodden, tangled remains of homes.